The most important and memorable phase of a woman in her life time would be when she carries her child in her womb. It is very important that woman is happy and healthy when she is pregnant. Conducting Valaikaappu Function is also one function that makes her happy. This function is usually performed in the 5th or 7th month that is calculated based on the Tamil months. During the 3rd month of Pregnancy, mother of the pregnant woman used to gift a black color Saree/dress to the pregnant woman. This is called Masakkai Karuppu. 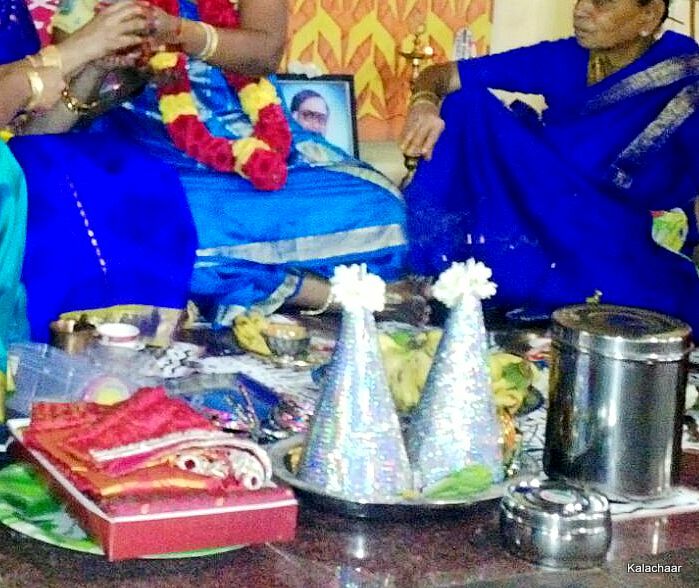 Valaikaappu function is usually conducted by the girl’s family. The function is preferably conducted in the early morning. One more girl who got recently married or who is yet to get pregnant (Thunai Manai) is also invited for this function. The most important ritual is to put Bangles for the pregnant lady. The Bangles are made of glass. There is an order in which the Bangles are to be put to the pregnant woman. Vepilai Kappu, Thanga Kaappu and then Velli Kaappu is the order. After that the Glass Bangles are put to the pregnant woman. The lady who is putting bangles to the pregnant woman is usually an elderly woman of the family. The number of Bangles also has significance in the function. In the right hand it is 21 and Left hand should have 20 Bangles (odd and even numbers). Have heard about wearing 21 and 19 Bangles in right and left hand respectively. The count of Bangles is excluding the 3 kaappu mentioned above. The same numbers of Bangles are worn to the other woman who got recently married. 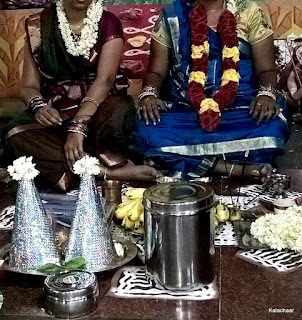 In some families, a young girl who is yet to attain puberty (kanniya ponnu) is also invited and Bangles are worn in the same number as of the pregnant woman. Bangles should be picked and kept at the Swami room at the home before the function starts for Kula Deivam. After delivery, the bangles should be offered to the God in Kula Deivam temple. After the Bangles are put to the pregnant woman, the visitors for the function are also offered with 4 Bangles each. The pregnant woman should take head bath; wear the saree that was worn by her on the day of wedding (koorai Pudavai-9 yards). She should be worn with a garland as well. A new saree is also gifted by her mother on the same day. Paruppu Thengai preferably Manoharam or laddu, Thirattipaal, Adhirasam, Murukku, Sweet are also offered to the Pregnant Woman on that day. In families those following Tanjore Tradition do not keep the Roasted gram Paruppu thengai (Pottu Kadalai) on this day. On the contrary, North Arcot Families prepare Roasted gram paruppu thengai for functions. After completing the ritual, Aarthi is taken for both the ladies. Nowadays, seemantham function is also performed on the same day. My next post is about Seemanthan and Poochoottal. Sure. That is in my list to publish. Will do it ASAP.